Audi has launched the RS Q3 - a 310PS turbocharged five-cylinder compact SUV that combines super-hot hatchback performance with semi-off-road ability. The RS Q3 should evoke memories of the original quattro thanks to its growling five-cylinder engine, but that's probably as far as the similarity goes, despite the cars' shared quattro heritage. The RS Q3 looks the part, thanks to black honeycomb grille insert, deeper front bumper, matt aluminum grille frame, and extensive colour coding of its new - and bespoke - bodykit. The SUV's performance will be 'useful' as its engine is shared with the TT RS, which is known for its flat trque curve, powerful top end and killer soundtrack. How well this allies with a high-riding SUV body, we'll have to wait and see, but it should be good, as the standard Q3 is very capable on the road, aside from a knobbly ride in sport form. 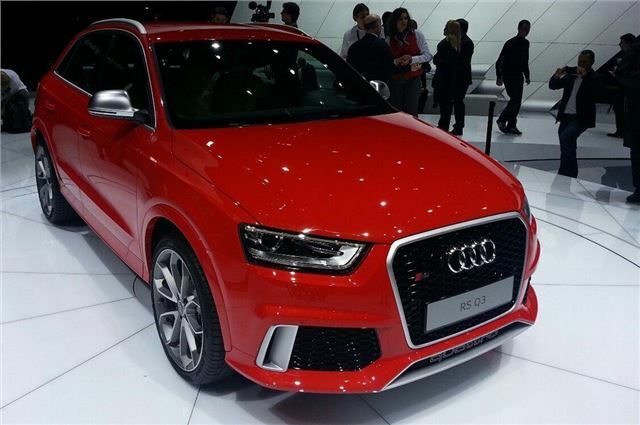 The RS Q3 gets a three-mode seven-speed S-tronic dual clutch gearbox with launch control. Its driven through an electro-hydraulic Haldex style clutch four-wheel drive system, with variable torque split. Performance claims are impressive: 0-62mph in 5.5 seconds with a limited maximum speed of 155mph. On-sale date in the UK is autumn 2013, and although the list price has yet to be confirmed, expect it to start at around £40,000 - rising with a very long optional equipment list.